After few days of the launch of the Vivo V15 Pro, the Vivo V15 was launched in the markets of the Thailand and Malaysia. The pre-bookings started in the last week of March 2019. Same like the Pro variant, the Vivo V15 also carries a pop-up front camera for selfies. The difference is that the V15 Vivo Pro is powered by a Qualcomm Snapdragon 675 SoC and has in-display fingerprint sensor while the new V15 is powered by a MediaTek Helio P70 SoC and has the fingerprint sensor at the back instead of the under-display fingerprint scanner. The company has finally launched the smartphone in India and is available via various online stores like Amazon, and Flipkart and as well as offline retailers. In India, the new Vivo V15 smartphone carries a price sticker of Rs 23,990. The smartphone is available in two color options- Glamour Red and Frozen Black while Topaz Blue is not on sale. 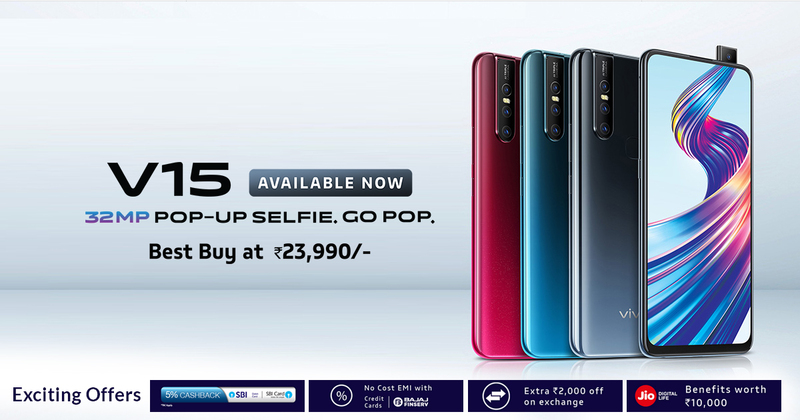 Aforementioned, the pre-bookings of the smartphone began in the last week of March 2019 through the Vivo India e-store, Amazon.in, and Flipkart. Now, the Vivo V15 can also be grabbed from Paytm Mall, Tata CLiQ, and many offline channels. Vivo V15 comes with the launch offers such as no-cost EMI options for up to 15 months, a one-time free screen replacement, Rs. 1,000 loyalty benefit over the experience value, and additional exchange value of Rs. 2,000. The device also come with benefits worth Rs. 10,000 from Reliance Jio which includes up to 3.3TB of data and the Jio Vivo Cricket Offer. Along with these offers, there are offers from the different banks including 5% cashback on SBI cards as well as EMI transactions. The Vivo V15 was launched in March 2019 in India and is the lower version of the Vivo V15 Pro which was launched in February in the country. The Vivo V15 runs on latest Android 9 Pie out of the box along with FunTouch Operating System. The dual-SIM (Nano) smartphone sports a 6.53-inch full-HD+ display with the screen resolution of 1080 x 2340 pixels. Under the hood, the new smartphone carries an octa-core MediaTek Helio P70 SoC. In terms of the optics, the Vivo V15 at the back carries triple camera setup which includes a 12MP primary sensor with an f/1.78 lens, 8MP secondary sensor along with an f/2.2 lens, and a 5MP tertiary sensor with an f/2.4 lens. At the front, the smartphone sports a pop-up camera of the 32MP sensor with an f/2.0 lens for selfies and video calling. While the Vivo V15 Pro carries a 48MP primary Quad Pixel sensor (enabling 12MP effective pixels) along with an f/1.8 lens, an 8MP secondary, AI (Artificial Intelligence) Super Wide-Angle sensor along with an f/2.2 lens, and a 5MP tertiary, depth sensor along with an f/2.4 lens. The Vivo V15 Pro also has many camera features like HDR, timelapse, face beauty, bokeh mode, AI body shaping, panorama, palm capture, and many others. There is also a face unlock feature in the Vivo V15 Pro which can be unlocked by the front camera. For security, there is also a fingerprint scanner at the back. In terms of the storage, the Vivo V15 has 6GB of RAM and 128GB of internal storage which can further be expanded up to 256GB through a microSD card slot. The smartphone holds a capacity of 4,000mAh battery which supports a Dual-Engine fast charging technology. The handset weighs 189.5 grams and measures 161.97 x 75.93 x 8.54mm. In terms of the connectivity, the smartphone includes Wi-Fi, 4G LTE, FM radio, Micro-USB with OTG support, Bluetooth v4.2, GPS/ A-GPS, and a 3.5mm headphone jack. While the sensors include an accelerometer, gyroscope, magnetometer, ambient light sensor, and a proximity sensor.